Traveling on a tight budget or just want to try something different? Travelers Pod has an ideal space for savvy travelers who are on-the-go and yet seeks a reasonable and comfortable place to stay for the night. Our Single Pods with curtain division beds offer that comfort. Single pods share ample common shower rooms and free Wi-Fi. What more could savvy travelers ask for? Standard Pods: Contemporary style with a sensible price, our Standard Pods offer comfort and privacy within your means. 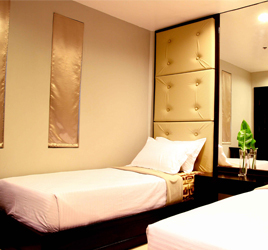 With centralized cable TV, free wi-fi ample common washroom and a choice either a cozy full size beds or twin single beds. 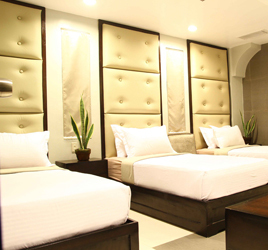 Deluxe Pods: Cozy twin beds or a double bed with high-speed Wi-Fi access, our Deluxe Pod is the ideal backdrop to your business or leisure activities when in Cagayan de Oro. With private hot and cold shower, 32” Cable TV, free wi-fi, fluffy pillows and a well-kept room add welcome touches of comfort. When traveling with the family or with a group of friends, our Premiere Pod is the ideal room to stay. The room could accommodate a group of 3 to 6. 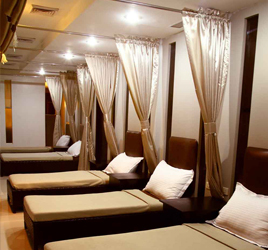 Our luxury Premiere Pods offers maximum relaxation during your stay. With a 32” digital cable TV, hot and cold shower facility, high-speed Wi-Fi to help you keep in touch and Daily housekeeping which offers welcome pampering in your stylish haven.